We are sure you have met one of them in the school! Our 3 guys come from the south east of France, where they were classmates. They studied management, accounting and law and join us here to both learn English and work! What could three French guys do in EC Toronto? Good question! Romain is in charge of the Junior Programme. Do you know what it is? During the summer, EC Toronto welcomes teenagers between 13 and 17 years old and organises a special schedule for them: English classes mornings and awesome activities afternoons, evenings and weekends! Follow us on FACEBOOK to know their summer activities because it’s still a secret kept by Romain! Xavier works with Joe and Candice, in the Academic team. He is in charge of organising student’s arrivals, attendance, tests… But he also organises activities the Academic Year students’ activities with Renee. He is looking for student’s talent to organise “EC GOT TALENT” on May the 30th: If you want to show your talent, don’t hesitate to contact him! Dorian is in charge of organising communication with students thanks to the “What’s on in Toronto” board and social networks: Facebook, blog and Instagram –he reminds you our Instagram competition is now open! Also, Dorian works with students who have projects to help them to communicate and promote their events. 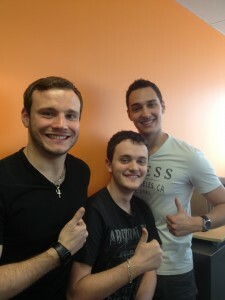 Please say hello when you see our 3 interns! The EC Toronto team is very happy to welcome them to our school!